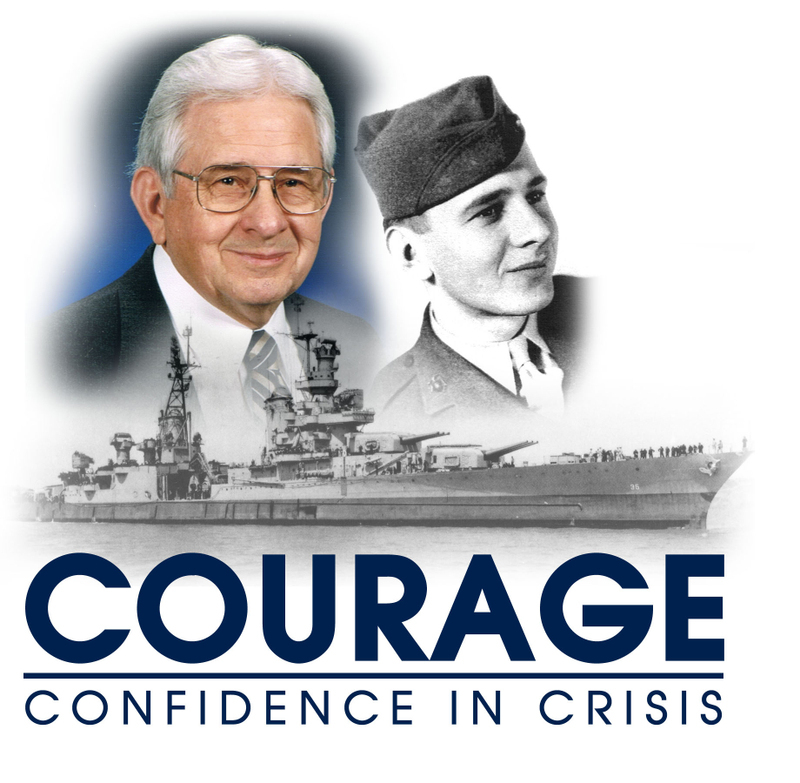 This is the story of Ed Harrell, one of the 317 survivors from the sinking of the USS Indianapolis at the close of World War II. Ed was our guest speaker on Memorial Day weekend. For more on Ed, go to www.indysurvivor.com. As we celebrate the Memorial Day holiday, it's important that we understand what this holiday represents and why it's important. Throughout Scripture, God would give instruction to the Israelites and His followers regarding memorials. Aaron's priestly garments had portions specifically designed to be memorials to God (Exodus 28.) Joshua was told to gather stones from the Jordan River bed as they crossed over as a memorial of what God had done (Joshua 4.) Prayers were considered memorial offerings in the New Testament (Acts 10.) Jesus even gave instructions about how the Passover meal, which was a memorial of God's salvation to the Israelites, would become a memorial of what Jesus did for us on the cross. So, you see, memorials are biblical. Memorial Day, originally called Decoration Day, is a day of remembrance for those who have died in our nation's service. There are many stories as to its actual beginnings, with over two dozen cities and towns laying claim to being the birthplace of Memorial Day. There is also evidence that organized women's groups in the South were decorating graves before the end of the Civil War: a hymn published in 1867, "Kneel Where Our Loves are Sleeping" by Nella L. Sweet carried the dedication "To The Ladies of the South who are Decorating the Graves of the Confederate Dead" While Waterloo N.Y. was officially declared the birthplace of Memorial Day by President Lyndon Johnson in May 1966, it's difficult to prove conclusively the origins of the day. It is more likely that it had many separate beginnings; each of those towns and every planned or spontaneous gathering of people to honor the war dead in the 1860's tapped into the general human need to honor our dead, each contributed honorably to the growing movement that culminated in General John Logan giving his official proclamation in 1868. It is not important who was the very first, what is important is that Memorial Day was established. Memorial Day was officially proclaimed on 5 May 1868 by General John Logan, national commander of the Grand Army of the Republic, and was first observed on 30 May 1868, when flowers were placed on the graves of Union and Confederate soldiers at Arlington National Cemetery. Today, we remember those who gave their all so we could have the privilege of living free. 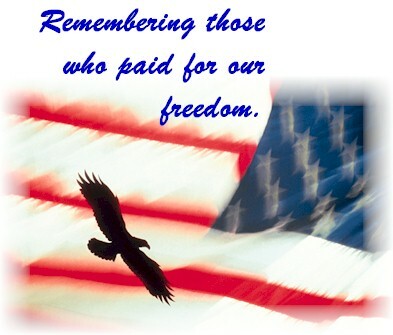 Many of you have loved ones who sacrificed greatly in service to our nation. We must ensure that we and the next generation never take for granted the sacrifices made. We must never take for granted our freedom. As it states on the Korean War Memorial in Washington, DC, "Freedom isn't Free!" OK, this is the time of year all the serialized television shows wrap up or leave us with a cliff hanger. I love these shows and thanks to Tivo, I can see them all. Random thoughts about the finales. . .
24 - What? This was the weakest season finale of the series. They pushed and pushed and then within about 15 minutes wrapped everything up with a happy ending, except of course Jack's girlfriend and the question of what's Jack going to do now. In seasons past, there's always been buzz about what was to come based on the finale. Not this time. I thought all season long that they were going to kill off Jack Bauer and then Ricky Schroeder would become the star. Glad they didn't do that, but still the finale was weak. Prison Break - This one ended weeks ago, but at least it left you wondering what was going to happen. I liked this one and am looking forward to a new season. Heroes - Haven't watched the finale yet, but it's saved on my Tivo. Apparently, the bomb goes off. This has been the best new series in this serial genre. Looking forward to seeing how it ended. Lost - The flashbacks to the possible future? Hated that. Killing Charlie. Saw it coming, but still didn't like it. It's time to bring back J.J. Abrams as writer and put Carlton Cuse back to another "Nash Bridges" type show. The finale was underwhelming. The big question is come next January, will Lost fans care to watch again. I will, but Lost is still not what it used to be. 7th Heaven - Didn't watch it. Just praying it never comes back. Years ago when it started, I liked it as a good family show. Now, when I've seen it, I cringe at the bad acting, terrible writing and the "church" scenes just irritate me. Please don't bring this back. Please don't bring a spinoff back with Lucy and her cardboard model husband. Yuck! The Unit - Hmmm. I like this show. Actually, I like the military part of the show. Can't stand the wives at home part. Their finale ended with a lot of questions. Who are the good guys now. Looking forward to this answer. Numb3rs - OK, this is the one. I watch this show each week, mainly because there's nothing else on Fridays that I like. I never saw the Chinese double-agent spy as a regular character coming. This was brilliant writing and I said to my wife when the spy was unveiled "Oh my! I never saw that coming. This is great." It reminded me of a good spy movie. If you haven't seen this finale, when they replay it, record it. It's worth it. Well, there you have it. These are the right opinions on all these shows. . .becaue they're mine. Ha ha. What do you think? The third and final installment of the "No Place Like Home" sermon series. This message looks at what it means to be "strong and courageous" when following Christ. Living for Christ is no walk in the park - it's going to require courage. It seems that everyone is running for President now. With all the options, you'd think someone would stand out above the crowd, but no one is. Mitt Romney battles questions over being a Mormon who claims Scientology founder L. Ron Hubbard's book "Battlefield Earth" is his favorite novel. Mike Huckabee is a former Southern Baptist pastor who seems to truly live his convictions, but unfortunately won't have enough money or name recognition to move ahead. Obama is the "rock star" candidate who is getting tons of press. Guiliani is a front-runner, but his personal life and views on conservative issues muddies his integrity. McCain, the war hero, is still trying to gain some momentum. Then there's Hillary. Enough said. What a year. So, amid this confusion, I'm drawn to some of the Presidents from books, TV shows and movies, that had characteristics that seemed very Presidential. If only these guys could run. David Palmer from "24" as played by Dennis Haysbert. Calm, cool, strong, a man of conviction. James Marshall from "Air Force One" as played by Harrison Ford. Hey, it's Indiana Jones as President. What can you say? Thomas Whitmore from "Independence Day" as played by Bill Pullman. Not too convincing as a President, but any president that can fly fighter jets and attack aliens must be a good guy. Gerald Fitzhugh from "Left Behind" as played by Louis Gossett, Jr. in the movie. Never saw the movie, but Gossett is good. The character from the book became an anti-Anti-Christ guy, so that makes him a good guy. James MacPherson from the books by Joel Rosenberg (The Last Jihad, etc.) MacPherson was a born-again, true Christian in office. Great character. Ulysses Grant from the television show "The Wild Wild West". OK, Grant was a real President, but Wild Wild West (the TV show with Robert Conrad and Ross Martin, not the terrilble film with Will Smith) was a favorite of mine. President Grant was James West and Artemis Gordon's boss. He appeared in a few episodes. So, who are your favorites? The second of a three-part series. This week we journey along with Dorothy and meet the Tin Woodsman. This guy joined them on the journey in order to get a heart. We, on the other hand, must get our hearts right in order to continue on the journey. Last night our family watched the finale of this season of Survivor. Hard to believe that this was the 14th season. As you know Survivor is the leader of all things "reality" on television. Of course, the only thing truly real in the show are the ratings and the payoff for the winner. Survivor is nothing more than a televised sociologial experiment. It is entertaining, but must be hard for a Christian to play. There have been some professing believers on the show, even this season, but since the premise is to "outwit, outlast, outplay" it often leads to some questionable scenerios. So, here we are a couple of episodes back when the big-time underdog, 54 year old Yao-Man wins a prize challenge. The prize is a fully-loaded F-350. He looks over to Dreamz, who is a homeless cheerleading coach (No joke, that's how they portrayed him. I still cannot figure that job title out. Apparently, there are groups of homeless cheerleaders needing coached,) and offers him a deal. Yao says "I will give you the truck if you promise to give me immunity, if you win it, when we get down to the final four." Dreamz says "I promise. I swear to God, etc., etc. etc." So, Yao gives him the truck. It was a great strategic move. However, when it came down to it, Dreamz won the challenge and was given a choice, to keep his word or not. Of course, he did not keep his word. This had to be one of the dumbest moves in Survivor history. I was watching this and when he did this, I said to my wife "Well, he's lost. There's no way the folks on the jury will vote for him." I was right! So, here's where it landed. Dreamz, who talked of teaching his son the right way to live and talked about having integrity, showed he didn't have any. I was impressed with Boo, who at least called him out on it. The sad thing is that I don't believe Dreamz ever really got it. He never saw the problem of what he did. Now, I know, it's just a game. It's how the games played. Yada, yada, yada. I've heard all that, and it's true. But now, here's this guy who just traded any inkling of integrity for the possibility of winning a million dollars (which, if he had a brain, would have known he had no chance for under the circumstances) in front of millions of viewers. Man, I'd hate to be him now. It's a show, but it also shows us the nature of our hearts. In the film "The Wizard of Oz," young Dorothy begins a journey down the yellow brick road to the Emerald City. In this city, is the great wizard with all the answers and the ability to get her home. How does this story parallel the Christian life? Listen to this message regarding "renewing our minds" as believers to discover the answers.